Top 6 cuisines in India that will blow your mind and must try it!!! India is home to many spices and flavours, and we Indians haven’t failed to make good use of them. Starting from the mountains in the North till the Indian Ocean in the South, these varied spices have been amalgamated and added into various curries, dishes and other delicacies. Based on the usage of these spice elements, we have listed down the top cuisines in India. North Indian dishes are definitely the chart-toppers for cuisines in India. Imagine the plethora of gravies, bread and desserts that will make you feel that you are on the top of the world. North Indians prefer their food to be rich and with lots of exciting flavours. They are also huge consumers of dairy products and hence we have the famous paneer, lassi and kulfi among many others. The key ingredient that they use is ghee which gives their curries that extra tinge of aroma. Some of the famous North Indian dishes that they have to offer are ‘Chole Bature’ (Punjab), ‘Rogan Josh’ (Kashmir), ‘Bati Churma’ (Rajasthan), ‘Murgh Dum Biriyani’ (Delhi), ‘Malai Ki Kheer’, ‘Aloo Samosa’, ‘Nihari Gosht’ (Delhi), ‘Butter Chicken’ (Punjab) and ‘Dahi Bhalla’ among many others. Flavours from the north-east are generally less in spice but rich in terms of aroma. North-east food is smoky and shares roots with our neighbouring China, Myanmar, and Bhutan. 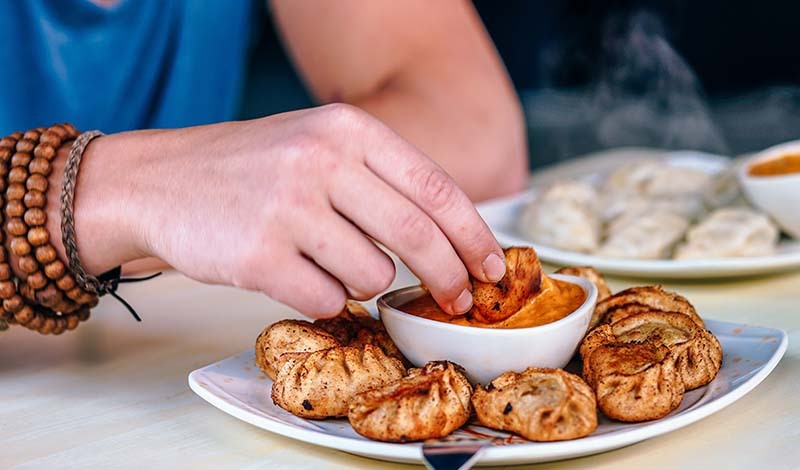 If you are a fan of delicacies like momos and dumplings, then their other dishes will make you spellbound as well. Manipur is famous for using banana leaves to serve food which shows the closeness between the Manipuris and nature. The key ingredients used in this region are rice, vegetables, and fish. Some of the lip-smacking dishes are ‘Khar’ (Assam), Kumurat Diya Hanhor Mangxo (Assam), ‘Pitha’ (Assam), ‘Fish Tenga’ (Assam), Sanpiau (Mizoram), ‘Vawksa Rep’ (Mizoram), ‘Smoked Pork’ (Nagaland), ‘Bamboo Steamed Fish’ (Nagaland),‘Nga Atoiba Thongba’ (Manipur) among others. 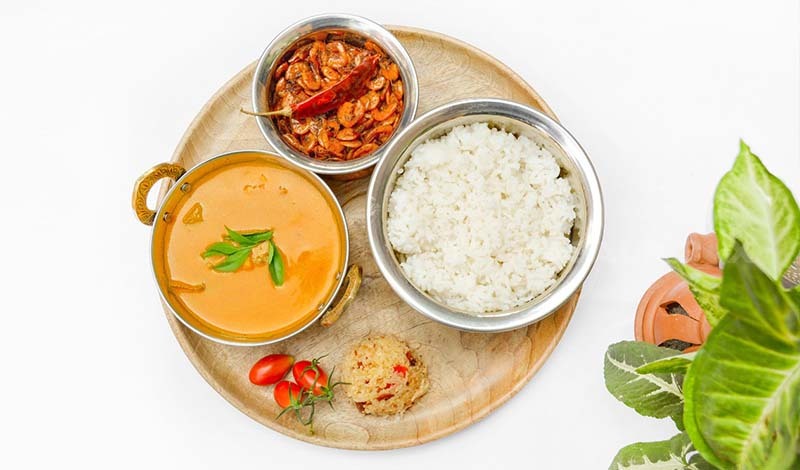 South Indian dishes vary from spicy to non-spicy and from sweet to sour. This region always serves a colourful and vibrant platter which will tickle our taste buds with different flavours. Just like Manipur, south Indians too have the habit of having their meals on banana leaves for special occasions. 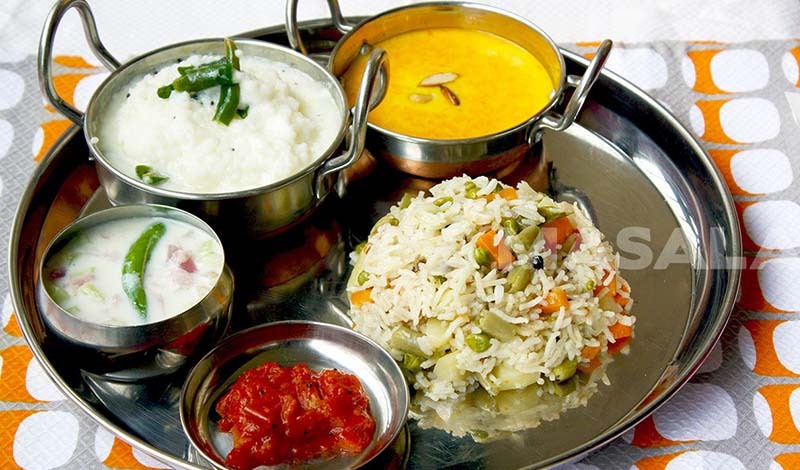 The most sought after cuisines of south Indian are from Kerala and Andhra Pradesh in general. While north Indians use spices for fragrance, south Indians use spice to actually feel the heat (mostly for meat or any other particular dishes). The most common delicacies are – Idli, Dosa, vada, Sambar, appam, south Indian biriyani, south Indian thali, sadya, and upma among many others. West Indian dishes can again vary from spice to non-spicy because it stretches all the way from Goa to Rajasthan. While Goa has a more mild approach towards flavours, Rajasthan can be quite intense. The main meat preference for the West Indians is fish, and they cook it in different methods and levels. Although this is the scenario, the Rajasthanis and Gujaratis are more passionate towards vegetables. 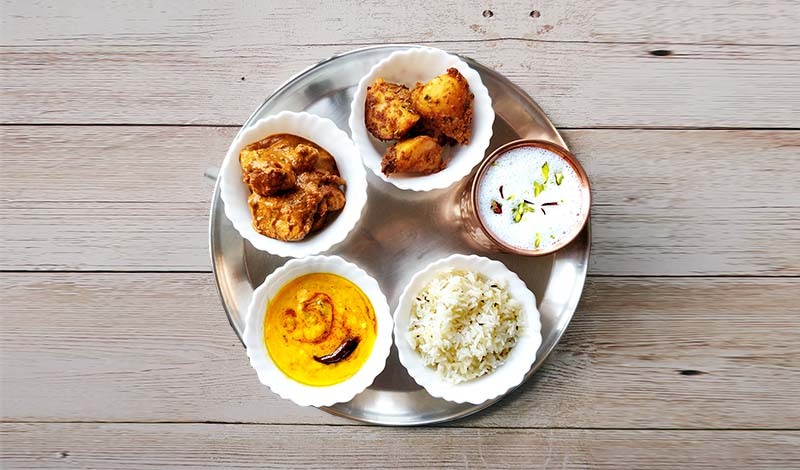 The key ingredients used in this region are coconut, spices, oils and even sugar in the case of Gujarat (Gujaratis add a pinch of sugar to almost any kind of dish). Some of the dishes that are offered by this part of India are- Pork Vindaloo, Chicken Xacuti, Fish curry, Bhelpuri, Thepla, Daal- Baati- Choorma, Laal Maas, Ghewar, Shrikhand etc. East India is home to tangy flavours and also to fish lovers. The main states that form a part of East Indian cooking are West Bengal and Odisha in comparison to Bihar and Jharkhand. While West Bengal and Odisha are more prominent with their fish, Jharkhand and Bihar are more inclined towards vegetables and pickles. The key ingredients used in East Indian cooking are mustard oil, maize, gram flour, green chillies and other spices. West Bengal is famous for their luchis, Alur torkari, Sandesh etc., while Odisha is famous for their milk cakes, spiced rice-coconut cake, chakuli pitha etc. The other famous East Indian dishes are Rassogolla, Sondesh, Begun Bhaja among many others. No one can ignore the blissful whiffs of Central India,one of the major cuisines in India, which are mainly Madhya Pradesh and Chattisgarh. From the streets to the 7-star hotels in Central India, one can always be high with all the unique sweets available. The famous ‘Shikanji’ that we all pine for during summers is an integral part of this cuisine. 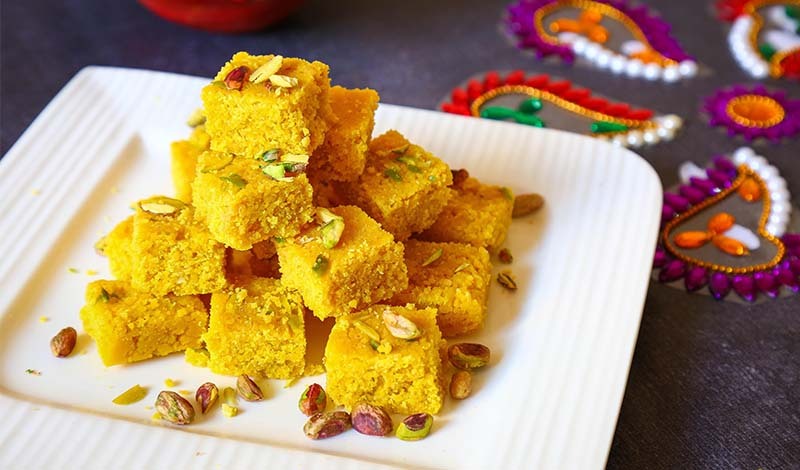 Although they do have a varied amount of dishes to offer, the charming people of Madhya Pradesh and Chattisgarh always have more of a sweet tooth. The key ingredients used in their delicacies are semolina, flour, ghee, almonds, sugar, coconuts, raisins etc. 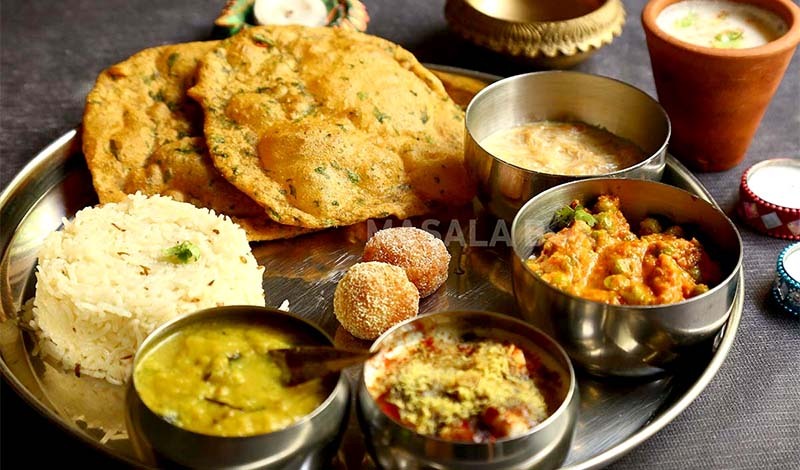 Some of the famous mouth-watering dishes are ‘Kusli’, ‘Lavang Lata’, ‘Cashew Barfi’, ‘Jalebi’, ‘Khurma’, ‘Moong Dal Ka Halwa’, ‘Sabudana ki Khichdi’, ‘Shikanji’ and varied cookies. Looks like the cuisines in India have made you hungry!!! And that’s why we are here. Subscribe to Masalabox and relieve your hunger.